January 18th, 2016. The official Digimon Linkz homepage updated to announce the creation of its dedicated LINE messaging account. The account is not just for Linkz, but will also send users information about -next 0rder-, Adventure tri., and other Digimon properties. Popular response to the account has been strong; within six hours the Linkz account acquired more than two thousand friends. Users can add the account on LINE by scanning its QR code. 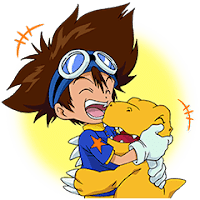 The account periodically sends news announcements in Japanese, and responds to messages with links to various Digimon sites. LINE is a multinational messaging application popular for its variable themes, avatars, and stickers. The stickers function like emoji with unique height and width parameters, and many companies have taken to making their own dedicated themes and stickers that fans can purchase in the LINE store. This is not the first time that Digimon has acknowledged LINE. Earlier this year Bandai released their own set of Digimon Adventure LINE stickers, featuring the eight Chosen Children and several of the anime's more prominent Digimon. Digimon Story Cyber Sleuth's in-universe Digiline messaging system also appears to have been inspired by the application. Digimon Linkz will launch on Android and iOS in 2016.
new scan for v jump is not out ? ?